Many of us, growing up (or even now), wish we could go visit a dinosaur theme park. I mean, how cool would it be if Jurassic Park were a real thing (minus all the people getting killed and eaten, of course)? I think the only thing cooler would be being the one in charge of the park. And that's what you'll be in Duelosaur Island, a new stand-alone Dinosaur Island spin-off game from Pandasaurus Games. Duelosaur Island brings back a lot of the same feeling that players loved about Dinosaur Island, but introduces an entirely new hand-management tableau-building engine that is unlike anything you’ve seen in Dinosaur Island, and a really tense “I cut you choose” dice drafting mechanic. “One of the things we loved most about the game is how much it felt like playing a game of Dinosaur Island, even though the mechanics are completely different. You still roll DNA dice, you still make dinosaurs, you still must manage your threat level. But then there is this super clever card mechanism that leaves you with so many tense decisions to make. And don’t even get me started on the dice-drafting mechanism. Once the DNA dice are rolled the first-player sets the market by assigning different dice different bonuses, but the second-player gets to choose first. Do you give the dice you need to good bonuses and risk your opponent taking them? Or do you play it safe and throw the solid bonuses on the dice you don’t want” said President of Pandasaurus Games Nathan McNair. Duelosaur is built around a clever hand management mechanism. Each card in the game serves 3 potential purposes. They contain the DNA sequences for dinosaurs you could create, the blueprints for attractions you can build and also are discarded to take certain actions. Do you create the Dinosaur on the top of the card attracting guests to your park? Or do you build the attraction on the bottom of the card, which can add to a players hand-limit, income and end-game VP? Or do you discard the card to combine DNA towards creating another dinosaur. Duelosaur Island comes with 5 brand new full-color “DNA dice”. 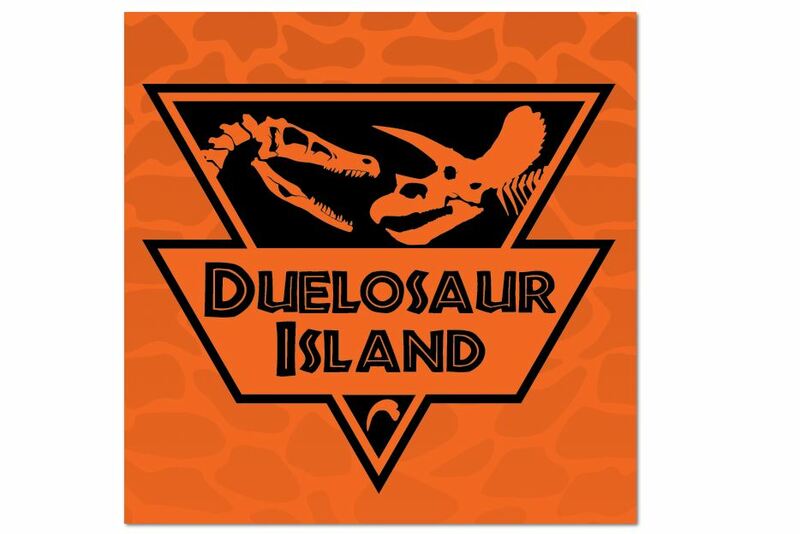 You can mix and match dice between Dinosaur Island and Duelosaur Island for even more variability in both games. Adding a copy of Duelosaur Island to your collection is going to unlock lots of cool new possibilities in Dinosaur Island like the brand-new security symbol that can appear on dice to upgrade your security level instantly! Mixing these dice in with the Dinosaur Island dice is a great way to add replayability to both Duelosaur Island and Dinosaur Island. And of course we had to get the band back together with all new artwork from Kwanchai Moriya and Peter Wocken on graphic design, bringing that same bright flashly 90s infused explosion to your tabletops. Joshua S: “I enjoyed the dynamic of choosing where to put everything for the DNA-drafting portion and then having your opponent choose first. I thought it was fun trying to give the dice you wanted better bonuses but still try to make other things look attractive enough for your opponent to choose them instead. Duelosaur Island is scheduled for release later this year at an MSRP of 34.95. And we’re just getting started. You didn’t think we would neglect the main Dinosaur Island game did you? Things are about to get bigger, a lot scarier, and there is a 100% chance of getting wet if you sit in the first 10 rows. Check back on March 12th, 2018 for even more exciting Dinosaur Island news.